Safety Score: 2,6 of 5.0 based on data from 9 authorites. Meaning we advice caution when travelling to Papua New Guinea. 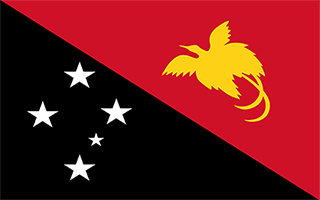 Papua New Guinea with its capital Port Moresby is located in Oceania (Oceania, group of islands including the eastern half of the island of New Guinea between the Coral Sea and the South Pacific Ocean). It covers some 462,841 square kilometers (slightly larger than California) with a population of 6,909,700. English and Hiri Motu are the languages spoken by people in Papua New Guinea. As an interesting fact, Indonesia is the only bordering country. Papua New Guinea is an island nation in Oceania. The country can be conveniently divided into 11 regions (7 on the main island and 4 island regions). In 2009, Papua New Guinea received 125,000 visitors, but only around 20% of these declared themselves as tourists. The country offers the traveler a true paradox. With little tourist infrastructure outside the main tourist areas, getting around can be tough. Tourism is well developed and growing in a handful of locations. Beyond these, the country is 120% adventure travel and not for the inexperienced or faint of heart. The topography is mostly mountains with coastal lowlands and rolling foothills. The average density of population is about 15 per km². The climate in Papua New Guinea can be described as tropicalnorthwest monsoon (December to March), southeast monsoon (May to October), slight seasonal temperature variation. Potential natural disasters are active volcanism, mud slides, severe volcanic activity; Ulawun (2,334 m), one of Papua New Guinea's potentially most dangerous volcanoes, has been deemed a Decade Volcano by the International Association of Volcanology and Chemistry of the Earth's Interior, worthy of study due to its , situated along the Pacific "Ring of Fire", the country is subject to frequent and sometimes severe earthquakes and tsunamis. To reach someone Papua New Guinea dial +675 prior to a number. The local cellular networks are operated on 900 MHz, 3G, 4G. Websites typically end with the top level domain ".pg". If you want to bring electric appliances (e.g. battery chaarger), keep in min the local 240 V - 50 Hz (plugs: I). The sign for the locally used currency Kina is PGK. - situated along the Pacific "Ring of Fire"